Artist''s impression of the black holes studied by the astronomers, using ULTRACAM attached to ESO's Very Large Telescope. This space wallpaper shows an artist's impression of the black holes studied by astronomers, using ULTRACAM attached to ESO's Very Large Telescope. 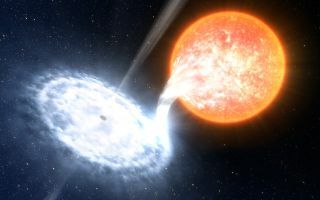 The systems — designated Swift J1753.5-0127 and GX 339-4 — each contain a black hole and a normal star separated by a few million kilometres. That's less than 10 percent of the distance between Mercury and our Sun. Because the two objects are so close to each other, a stream of matter spills from the normal star toward the black hole and forms a disc of hot gas around it. As matter collides in this so-called accretion disc, it heats up to millions of degrees. Near the black hole, intense magnetic fields in the disc accelerate some of this hot gas into tight jets that flow in opposite directions away from the black hole. The orbital period of Swift J1753.5-0127 — just 3.2 hours — is the fastest found for a black hole. The orbital period of GX 339-4, by contrast, is about 1.7 days.